STAR Board member Roger Titford has a new book out. 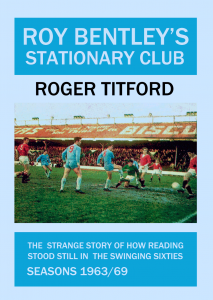 It’s about Reading in the 1960s, and it’s called Roy Bentley’s Stationary Club. It takes a close look at Roy’s time as manager from 1963-69 and the struggle he had to move the club forward in a fast-changing era. There are a few surprising parallels with the club today – including an early version of Club 1871 and a new club song that lasted one match! The book is available from the Megastore or online via When Saturday Comes for £12, postage free. Roger will be doing a signing session in the Megastore before the Sheffield United game on Saturday 8th December.